Pittsburgh’s downtown area, known as the Golden Triangle, is a prime place to snap memorable engagement photos. The city’s splendid geography includes abundant hills, a trio of rolling rivers, woodland valleys and other album-worthy locations. Whether you’re looking for a cultured angle or a more natural look for your pre-nuptial snapshots, the Steel City has it all. No other city in the United States – indeed, in the world – has Pittsburgh’s unique vantage point. Perched at the confluence of three rivers – the Allegheny, Monongahela and Ohio, respectively – it has a triangular central business district. Plus, it’s a fairly compact downtown area; you’ll be able to shoot many photos in a relatively short amount of time. The city’s welcoming atmosphere and remarkable architecture will ensure you’ll enjoy breathtaking backdrops during any month of the year. Begin your engagement picture schedule at the base of Pittsburgh’s tallest building, the US Steel Tower. Situated at 600 Grant Street, this impressive structure embodies the Steel City’s past & future. Pittsburgh’s storied industrial heritage and forward-thinking design & planning can be captured simultaneously. Unlike other skyscrapers, the US Steel Tower has three sides – a nod to the surrounding Golden Triangle area. Have your photographer take some shots in front of the tower’s expansive entrance lobby. You’ll also want a few photos along Grant Street for additional depth. For winter engagement sessions, the US Steel Tower’s courtyard features a crèche (nativity scene) that’s renowned for its robust dimensions and meticulous attention to detail. Interestingly enough, it’s the only nativity scene in the U.S. to be officially authorized by the Vatican. Gothic, glossy grandeur defines another Pittsburgh skyline standout, PPG Place. This soaring glass castle arrangement is regarded as the (literal) sparkling gem of the Golden Triangle. It offers romantic vantage points for your engagement pictures – any time of day, and all year round! The complex is actually a series of buildings arranged about a spacious courtyard. PPG Place is ideal spot to capture a range of expressions & themes – from whimsical to intimate, you’ll be able to photograph a variety of fun photos. Spring and summertime engagement photographs will feature dazzling, reflective light from the surrounding glass buildings. Even on overcast days, it’ll appear brighter and more luminous than other areas of the city. If you’re doing a wintertime session, take some pictures in front of the ice rink and Christmas tree. Other highlights include Wintergarden, a flower-filled, glass-enclosed area that features Santa Clauses from different countries around the world. The area can be toured by the public from November through mid-January. The northern edge of PPG Place leads directly into Market Square, a small shopping district in the heart of Pittsburgh. Charming storefronts serve as an ideal backdrop for more engagement pictures. Each business has its own architectural style, and you’ll find an exceptional range contained within this quaint retreat from the hustle & bustle. Market Square’s center has a small park with benches and a grassy expanse – a great spot to capture natural & city landscapes in one photograph. Grab a coffee or a quick bite to eat as you recharge for other prime Pittsburgh picture-taking locales. Pittsburgh’s Cultural District is situated directly northwest of Market Square and faces the Allegheny River. Well-lit and visitor friendly, this area deserves its own detailed itinerary for engagement photography. 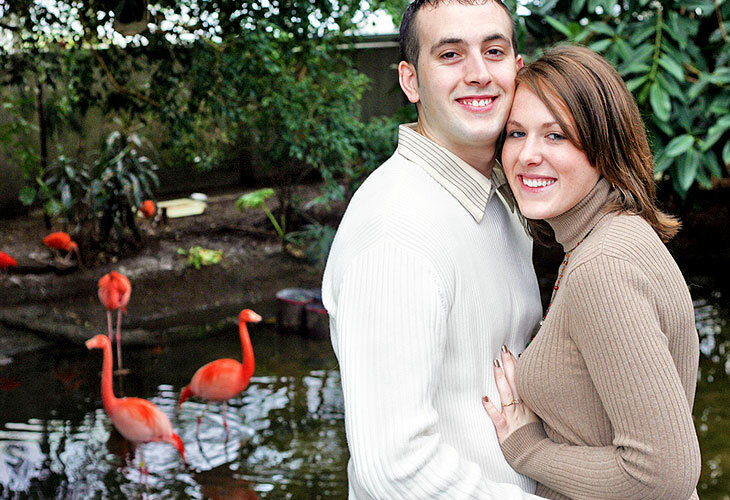 Suffice it to say, there are a few highlights that will enhance your pre-nuptial picture album. Be sure to snap a few shots in front of a pair of Pittsburgh institutions, Heinz Hall and the Benedum Center. Located at 600 Penn Avenue, Heinz Hall is the home of the Pittsburgh Symphony Orchestra. Virtually any shot along the building’s impressive façade will be a worthy addition to your engagement photography. The Benedum Center, just north of Heinz Hall at 719 Liberty Avenue, stages performances by the Pittsburgh Opera, Pittsburgh Ballet Theatre, and Pittsburgh Civic Light Opera. Its fanciful architecture and classic profile provide your engagement photos with an unforgettable backdrop. Call ahead to schedule an interior tour. The center’s stunning Grand Lobby has a beautiful array of mirrors & chandeliers designed to mimic the Palace of Versailles’s famed Hall of Mirrors. Finish your Steeltown photography swing at the Allegheny County Courthouse, the crowning achievement of renowned architect Henry Hobson Richardson. This modern Gothic structure was completed in 1886 and was considered the finest building in Pittsburgh at the time. After all these years, it still holds its own – especially for your engagement pictures. Be sure to gain access to the interior courtyard, where you can shoot some pictures in front of the fountain. The courthouse also boasts a “Bridge of Sighs,” an arched walkway connected to the now-defunct jail. It’s a notable backdrop to complete your Pittsburgh photography session.